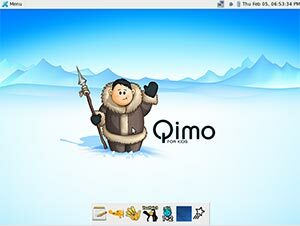 A large collection of operating system based on Linux are available now and most of them have designed for specific purposes and uses.Some Linux desktops are also developed and designed specially for kids.Qimo is one of the linux based operating system for kids. Qimo is an open source and free desktop operating system designed for kids.Qimo is actually based on ubuntu linux(One of the popular desktop operating system).Qimo is one of the popular Linux Desktop for kids/children of age 3 and above.Qimo comes with educational games(which is installed by default) with large icons and easy to use graphical user interface(GUI).Qimo use XFCE desktop,the default desktop environment for Xubuntu. After downloading the ISO file,burn it to a CD/DVD and then install it like any other Linux Based operating system.